第一次接觸 IOmeter 可以先參考這一篇 Iometer quick start – http://benjr.tw/435. Iometer: consists of two programs, Iometer and Dynamo.Iometer is the controlling program. Using Iometer’s graphical user interface, you configure the workload, set operating parameters, and start and stop tests. Iometer tells Dynamo what to do, collects the resulting data, and summarizes the results in output files. Only one copy of Iometer should be running at a time; it is typically run on the server machine. Dynamo: is the workload generator. It has no user interface. At Iometer’s command, Dynamo performs I/O operations and records performance information, then returns the data to Iometer. There can be more than one copy of Dynamo running at a time; typically one copy runs on the server machine and one additional copy runs on each client machine. 簡單的來說就是 Iometer 是由 "控制" 以及 "顯示執行結果" 的兩隻程式所組合而成的.其中 "控制" 就是 Dynamo 主要是產生硬碟壓力測試的程式.不管要測試的平台是 Windows 或是 Linux 都要安裝這兩支程式.但是在 Windows 他會一起把這兩個程式一起帶起來.注意觀察一下執行在 windows 平台時除了 Iometer 的顯示畫面外還有一個 command line 的程式也被帶起來.這就是 Dynamo. 這裡是專為 Linux 平台講解 Iometer 的工作方式,主要在使用 Iometer for Linux 時需要兩支程式. dynamo 主要是安裝在 Linux 下的.也是 iometer 主要在跑的程式. Dynamo 有 windows 和 Linux 版本的但是 Iometer 只有 windows 版.所以在 Linux 平台下還需要額外一台 windows 的 iometer 看執行結果. 目前 iometer 的版本 2008 的是 iometer-devel 的版本, 2006 是 iometer-stable 的版本. 在 Windows 環境中點選 start / All programes / Iometer 2006.07.27 / Iometer 開啟 iometer ,不過他同時也會開起 dynamo 這隻程式. 目前不管是 SATA 或是 SAS 還是 JBOD / Storage 的硬碟應該都會表示成 sdx . worker 的數量取決於系統上的 CPU 各數,同時每個 worker 可以讓你指定磁碟同時執行的執行緒 thread 數目.一個 worker 執行一個 thread,不過通常我們只會跑一個 worker,只有應用在對一些高性能伺服器或是企業級級的儲存設備才需要增加 Worker 數目,已取得最大的效能值. 黃色的圖示所代表的是 "logical drive 邏輯磁碟" ,通常在 Windows 下的硬碟多是黃色的圖示. 如果黃色的圖示加上紅色刪除線所代表的是該邏輯磁碟並沒有 iobw.tst 檔案,iometer 在做測試時是透過 iobw.tst 檔案來進行 "寫入/讀取" 的測試.通常是尚未做過 iometer 的硬碟才會有這種圖示. 藍色的圖示是 "原始(RAW)磁碟" 的意思,在 Linux 下通常看到的都是這一類的硬碟. 有一點要注意的是當你的 iobw.tst 檔案已經建立好,必須刪除 iobw.tst 再去調整設定 Maximum Disk Size / Starting Disk Sector 才會改變 iobw.tst 檔案的大小. 一般的硬碟 sector 大小為 512bytes (sector 為硬碟最小儲存單位),如果這邊是使用預設值時,寫入所有該磁碟的所有磁區(Sector),如果你想測是固定大小時可以透過設定 Maximum Disk Size 與 Starting Disk Sector . 如果你設定 Maximum Disk Size 為 100 就會寫入資料 100 *512 bytes 大小的資料,而 Starting Disk Sector 可以指定由哪一個 sector 開始寫入. 要注意的一點是當我們所設定的 "Maximum Disk Size" 大小在記憶體 Buffer 的限制容量以內時,系統會以 Buffer 來當成硬碟,所以跑出來的效能會超高也是這原因. 至而 # of Outstanding I/O 主要是在模擬測試同時多個應用程式向 I/O 請求讀寫,預設值是 1 .一般是不會是用到這個項目.除非是用在 NAS / SAN 上面.在 "Test Setup / Cycling Options" 選項中 Cycle # Outstanding I/Os 即是以此方式逐步增加同時 I/O 的讀寫,1,2,4,8..預設以2的等比級數增加. 用不同的 pattern 跑出來的值其結果會相差很大,你可以使用系統中 pattern 來跑或是你也可以 Access Specifications/new 一個屬於自己的 pattern. Intel 的建議值為 64k,這大小會影響到 Total I/O per Second 的結果.通常愈大直就越小,越小通常值越大. 不管新增加的是 disk / network workers 都不會成為預設值. 不管新增加的是 disk / network workers 都會成為預設值. 請參考 Iometer 官方網站說明 – http://iometer.cvs.sourceforge.net/*checkout*/iometer/iometer/Docs/Iometer.pdf ,一般使用預設值即可. 一些比較高級的 RAID 系統通常會有一塊 RAM 當作 I/O 快取記憶體的時候,為避免一開始所得到的值是來自於這些快取,系統會將 # Ramp Up Time 所設定的時間不列入計算中.以便得到真正 I/O 的值. 我們在進行 iometer 時,可能測試時間為一分鐘但每一秒的結果皆不同.這邊會幫我們顯示出從一開始到目前為止所平均出來的值.這值會和儲存下來的 csv 檔結果一致. 顯示的結果為單位時間內的平均值,假如我設的 Update Frequency 為5秒,這邊顯示的就是這5秒的平均值..其實不用管這邊的結果在儲存的 csv 檔就會幫我們記錄其測試結果. 每秒 I/O 數的平均值.這和 Access Specifications 設定的 Transfer Request Size 相關.通常愈大直就越小,越小通常值越大. 每秒可以傳送的資料量,單位為 MBytes.要得到較好的 Total MBs per Second 需要將 Transfer Request Size 設定大一點. 把 Sequential和 Read 設定為 100% . 除了 iometer 可以來測試硬碟的速度,你可以透過 hdparm – http://benjr.tw/450 這是一個比較簡單的方式來看目前硬碟傳送的速度. Transfer Request Size(傳送資料大小): 512 Bytes. Transfer Request Size(傳送資料大小): 64 KByte. Transfer Request Size(傳送資料大小): 64K Byte. Percent Read/Write Distribution(讀/寫): 讀 80%,寫 20%. Percent Random/Sequential Distrution(隨機率): Random 100%. Transfer Request Size(傳送資料大小): 8K Byte. 在 Disk Targets 前面有介紹過 # of Outstanding IO: 主要是在模擬測試同時多個應用程式向 I/O 請求讀寫,預設值是 1 .一般是不會是用到這個項目.除非是用在 NAS / SAN 上面.不過這邊是固定數目的 I/O 請求讀寫,在 "Test Setup / Cycling Options" 選項中 Cycle # Outstanding I/Os 可以用等比(1,2,4,8..預設以2的等比級數增加)或是等差(1,2,4,6,8…預設以2的等差級數增加)方式逐步增加同時 I/O 的讀寫.作用在模擬真實環境當使用使增多時 I/O 讀寫是否會受到影響.可用於 NAS 環境測試. Cycle # Outstanding I/Os 有兩種方式. Cycle # Outstanding I/Os — run step outstanding I/Os on all disks at a time. 假若我們設定成等差(Linear Steeping),並將 # of Outstanding I/Os control group / End 設定為 8 ,Iometer 會逐步 1,2,4,6,8 (預設以2的等差級數增加) 同時 I/O 的讀寫. 假若我們設定成等比 (Exponential steeping),並將 # of Outstanding I/Os control group / End 設定為 8 ,Iometer 會逐步 1,2,4,8 (預設以2的等比級數增加) 同時 I/O 的讀寫. 如果我們選擇等比 (Exponential steeping),並將 # of Outstanding I/Os control group / End 設定為 8 ,在這選項中會針對所有的 Disk 同時存取. 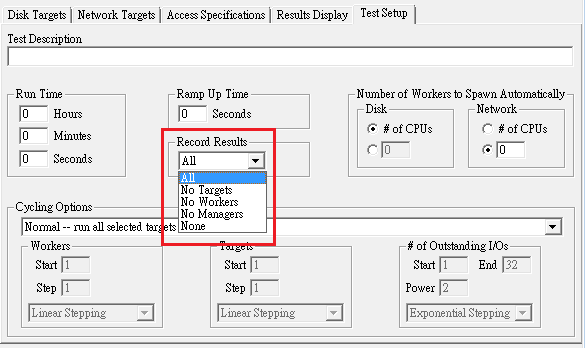 All workers use 1 outstanding I/O per target on all selected targets. All workers use 2 outstanding I/Os per target on all selected targets. All workers use 4 outstanding I/Os per target on all selected targets. All workers use 8 outstanding I/Os per target on all selected targets. Cycle # Outstanding I/Os and Targets — run step outstanding I/Os on step targets at a time. 如果我們選擇等比 (Exponential steeping),並將 # of Outstanding I/Os control group / End 設定為 8 在這選項中只會針對單一的 Disk 存取.所以當你指定 Target Disk 為兩顆時需要執行 4*2 =8 次的測試. All workers use 1 outstanding I/O per target on 1 target. 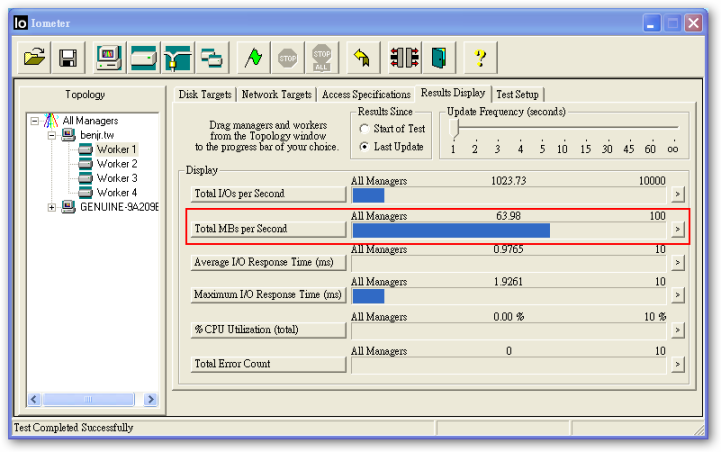 All workers use 2 outstanding I/Os per target on 1 target. All workers use 4 outstanding I/Os per target on 1 target. 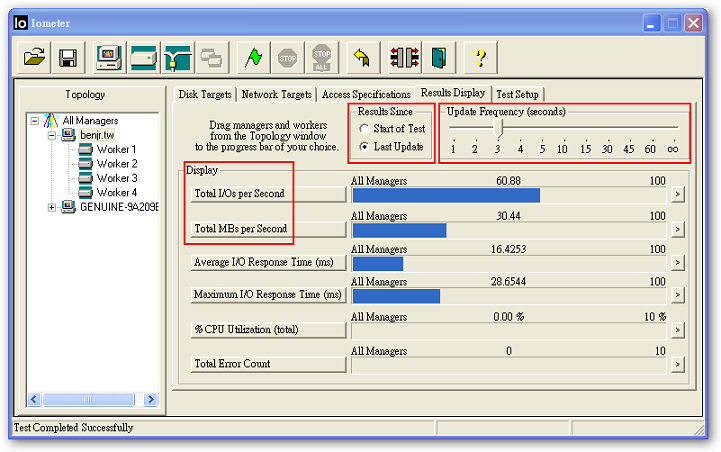 All workers use 8 outstanding I/Os per target on 1 target. All workers use 1 outstanding I/O per target on 2 targets. All workers use 2 outstanding I/Os per target on 2 targets. All workers use 4 outstanding I/Os per target on 2 targets. 測試完 Iometer 會儲存一個預設的檔案 result.csv 檔,雖然我們可以直接在 Iometer 上的 Results Display 看到結果,不過最完整的報告還是可以透過 .csv 轉成 Excel 格式來看會是最清楚的方式. 檢查下你 Linux 或是 Windows 的防火牆是不是有開啟. Using performance counter frequency: 1.94865MHz. 回應則是make: *** No rule to make target `dynamo’. Stop. 回應則依然是make: *** No rule to make target `dynamo’. Stop. unless you are running dynamo on XSCALE CPU. GetReceiveResult()failed on dynamo login port! I have the same problem. Windows version of 2008.06.22 RC2 version is also OK. Have you post this problem to IOmeter user mailing list? 最近我也遇到相同的問題,在 RHEL 5 32 位元所編繹出來的 dynamo(iometer-2008-06-22-rc) 似乎無法正確來使用. dynamo: ELE 64-bit LSB executable, AMD X86-64 , VERSION 1(SYSV), FOR GNU/LINUX2.6.9………..
Iometer consists of two programs, Iometer and Dynamo. run on the server machine. copy runs on each client machine. 簡單的來說就是 Iometer 是控制以及顯示執行結果的程式而 Dynamo 是產生硬碟壓力測試的程式.不管要測試的平台是 Windows 或是 Linux 都要安裝這兩支程式.但是在 Windows 他會一起把這兩個程式一起帶起來.注意觀察一下執行在 windows 平台時除了 Iometer 的顯示畫面外還有一個 command line 的程式也被帶起來.這就是 Dynamo. Dynamo 有 windows 和 Linux 版本的但是 Iometer 只有 windows 版. 所以你還需要額外的一台 windows 的 iometer 看執行結果. 先使用指令 #file 檢查 dynamo 檔案是否為 Linux 的執行檔(#file dynamo). 在你 Windows Server 2008 R2 (64bit)的客户端執行 DYNAMO.exe 這一支程式,在你的控制台 Windows XP 執行 IOMETER.EXE 即可. Looking for Iometer on \"10.11.130.111\"
目前我用的版本 iometer-2008-06-22 和 iometer-2006_07_27 都不曾遇過這個問題. Displays the average or sum of the data gathered since the beginning of the test. Displays the statistics collected since the previous update. For example, if the Update Frequency is set at 5 seconds, the values displayed will be the average or sum of the data collected during the last 5 seconds. Start of Test – 如果你在系統上跑過很多種 pattern 你可以用 Start of Test 來看剛剛所有跑過的 pattern 值平均或是總和. Start of Test – 我們在進行 iometer 時,可能測試時間為一分鐘但每一秒的結果皆不同.這邊會幫我們顯示出從一開始到目前為止所平均出來的值.這值會和儲存下來的 csv 檔結果一致. Last Update – 顯示的結果為單位時間內的平均值,假如我設的 Update Frequency 為5秒,這邊顯示的就是這5秒的平均值. 是的,如果要看即時的結果,建議勾選 “Start of Test” ,並將 “Update Frequency” 設為 1 second. 你好 我可以請問一下 我使用 Iometer 2006.07.27 ，它所儲存的.CSV都是最後的結果 ，我可以把它每秒的值儲存下來嗎?? 你可以試著將測試改為 Cycle # Outstanding I/Os 如 Step 8 ,並將時間縮短.可以儲存到多個 Outstanding 結果. # of Outstanding IO 主要是在模擬測試同時多個應用程式向 I/O 請求讀寫,所以有可能會因為值太大反而會引響到硬碟的效能. 請問你用的 iometer 版本為何? 之前我在使用 iometer-2006_07_27 時也遇到一些怪問題,後來改用 iometer-2008_06_22 情況就有改善了!! 想請問一下你的 Dynamo 是 windows 版的還是Linux 版的. 所以 600(SATA 3G) / 8(硬碟) = 75Mbytes(單顆 SATA 硬碟的傳輸平均大約也是這個值). 雖然 SATA 的每一代都以倍數增加 Generation 1(1.5 Gbit/s) ,Generation 2(3 Gbit/s) , Generation 3(6 Gbit/s).,這邊所提昇的是資料傳輸頻寬. 但單顆硬碟的最大效能還取決在轉速,一般 SATA 硬碟轉速為 7200 rpm.並不會因為 SATA 1.0 , 2.0 ,3.0 而變快.除非使用 RAID 或是 SSD 的儲存裝置. 會你可以嘗試詢問一下 RAID 的廠商或是你 Server 的廠商,有可能是 F.W , Driver …上的問題. 看樣子你測試的應該是 Storage (NAS / SAN), Outstanding I/Os 可以提高一些來做測試. OS 碟的傳輸速度不至於影響到測試碟的傳輸速度.Iometer 主要是針對 Raw device. Total I/O per Second 這個數值所表現出來的是指每秒的IO流量? Total MBs per Second 這個數值所表現出來是指頻寬? Q:Total I/O per Second 這個數值所表現出來的是指每秒的 IO 流量? Q:Total MBs per Second 這個數值所表現出來是指頻寬? 雖然 SATA 2 可以到達 3Gbit (300MBytes)但單顆硬碟在傳輸量大多只有. A:硬碟的最小單位為 sector ,每個 sector 出廠預設為 512 bytes,所以要測出最大的 I/O 量會直接使用 512 bytes 為測試單位,但硬碟最大傳輸量就需要更大的資料大小才可以測試出通常建議是 64kbytes,但都只是建議值. 1.Transfer Request Size(傳送資料大小): 8K Byte. web server, file server 這些 pattern 是參考了 iThome 的測試值,預設並沒有這些 pattern 需要自行建立.